Since 2008, the Marvel Cinematic Universe (MCU) model has introduced ingenious engineers, Norse gods, space raiders and sorcerers. These superpowered figures appear in films that incorporate elements from World War II movies, space opera, heist films, alien invasions and conspiracy thrillers. With varying levels of dramatic success, the framework of a superhero figure in [insert genre here] has proved very malleable and profitable. Now, Marvel faces perhaps its greatest challenge — racism! Pleasingly, the contest of superhero films versus hate groups tends to favor the former, as campaigns against “Thor” for the presence of Idris Elba and against Black Panther itself failed to dent the films’ box office success. But whereas “Thor” as well as the earlier “Blade” series featured only one prominent black character, Black Panther is a bolder statement, as this film’s cast almost entirely consists of people of color. This emphasis on non-white culture is far from skin deep, as Afrofuturism influences the film’s design, costumes, music and themes. There is also social anthropological detail, which echoes the research of Victor Turner on African tribes. Turner identified that in indigenous African cultures, individuals occupy a key liminal phase at times of transition, such as those between child and adult and when a civilian ascends to a higher role such as chief or king. While in this liminal phase, the individual is simultaneously in neither stage yet possesses elements of both. Liminality is also key to superhero identity, as superheroes occupy phases between law and crime, civilization and anarchy, organic and technological, ordinary and extraordinary. In Black Panther, liminality is played out quite literally in a rite of passage that is central to the drama. The viewer may feel like an observer to this ritual and to the film’s world as a whole, perhaps like CIA agent Everett K. Ross (Martin Freeman, “The World’s End”), who takes on an outsider role in a reversal of typical Hollywood racial binaries. 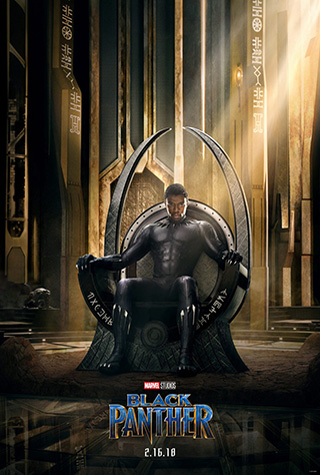 Beautifully though, the film’s approach to anthropology is cultural immersion, offering an enthralling experience for the viewer in the (fictional) country of Wakanda, previously visited in “Avengers: Age of Ultron.” Wakanda is gloriously realized: A vibrant, richly detailed and lovingly textured environment of equality where tradition stands side by side with modernity. Much of Wakandan technology would not seem out of place in “Star Trek,” while costume and make-up draws from various African cultures. Director Ryan Coogler and production designer Hannah Beachler blend these potentially disparate elements wonderfully, from the wooden paneling and 3D imaging of Wakandan aircraft to a sleek laboratory where Shuri (Letitia Wright, “The Commuter”) builds dazzling equipment and puts the workshop of Tony Stark to shame. Much of this equipment is used by Shuri’s brother, the titular hero T’Challa (Chadwick Boseman, “Marshall”), new king of Wakanda after the death of his father in “Captain America: Civil War.” Boseman blends stoicism, uncertainty and charisma in the role, often communicating more through gesture than dialogue. This physical performance extends to the action which is helpful since the Black Panther suit covers T’Challa entirely, but when he appears on a tree branch, leaps onto a car or duels with a adversary, the character is still clearly expressed in all his regal danger. Nor is he alone as, perhaps surprisingly for a film with an eponymous character, Black Panther features quite the ensemble cast. Coogler and co-writer Joe Robert Cole surround T’Challa with allies including his mother Ramonda (Angela Bassett, “London Has Fallen”), spy Nakia (Lupita Nyong’o, “Queen of Katwe”), loyal soldier General Okoye (Danai Gurira, “All Eyez on Me”) and advisor Zuri (Forest Whitaker, “Rogue One: A Star Wars Story”), as well as more antagonistic figures such as M’Baku (Winston Duke, “Modern Family” TV series), Ulysses Klaue (Andy Serkis, “Dawn of the Planet of the Apes”) and Erik Killmonger (Michael B. Jordan, “Creed”). Intelligent writing incorporates these rounded characters into the stylish locations and fluid action, and these characters all have their agendas and goals, their arcs often tied to the film’s remarkable political aspects. These aspects go far beyond the window dressing of “Captain America: Civil War,” as an actual civil war threatens Wakanda and the film offers in-depth consideration of the proper uses of power, beyond that of an individual. Unlike Iron Man and the Hulk, T’Challa is not only a superhero but a head of state, responsible for the domestic and foreign policies of his country and its relation to the rest of the world. Debates between isolationism and intervention abound throughout the film, as do discussions about the treatment of people of color, such as the political agenda of Killmonger that is closely tied to racial inequality. The almost entirely black cast emphasizes this tension, yet the racial politics are an organic part of the drama rather than an interruption or pause for a soap box-style proclamation. The film’s post-colonial bitterness and sense of social responsibility run alongside super cool set pieces, which are shot through with style and energy. Coogler favors action in the frame rather than frenetic editing, which adds to the sense of immersion as the viewer sees events in their entirety. Director of photography Rachel Morrison utilizes long takes that capture the debates of King T’Challa’s council chamber as well as the blistering action, especially in a bravura set piece that showcases Wakandan combat, a scene as vibrant and thrilling as anything thus seen in the MCU. Spears with sonic capability, computerized beads with special functions clash with guns and bullets as well as axes and machetes. Perhaps most thrilling, however, are the dazzling displays of unarmed martial arts combat, enhanced by the vibranium suit of the Black Panther that absorbs energy and emphasizes the fluid motion of T’Challa, whether we are seeing Boseman himself or a digital double. The suit combines the sleek power of Captain America with the cool of Iron Man, and comes complete with claws that slice through metal and stone as easily as they do flesh and bone. Not that Black Panther is an R-rated bloodbath a là “Logan” — it is as family accessible as any of its Marvel predecessors and might even serve a useful educational purpose. Young audiences may have their curiosity piqued about race relations and seek to learn more, while audiences of all races and genders can take away a message of equality and cooperation. As with “Zootopia” and “Moana,” Disney demonstrate their remarkable penchant for progressive stories, wrapped within entertaining genre movies. For this, the studio is to applauded. Overall, Black Panther is both a brilliantly crafted film in its own right, and a superb addition to the MCU. As a superhero, T’Challa proved in “Captain America: Civil War” that he could hold his own against such stalwarts as Hawkeye and Black Widow. Now in Black Panther, he invites us to his homeland and makes the viewer very welcome indeed.